These are pretty scarce notes. Not many banks chose to issue such a high denomination in the late 19th century. 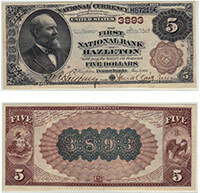 The most generic examples in circulated condition are still worth around $3,000 each. There is a lot of room for that price to get higher. The condition and bank of issue are both extremely important. Contact us for details. Don't forget to check the serial number. Number 1 notes always sell for nice premiums.